Rivers are much wider than they are deep, although this may not be apparent to a layman. For example, the Upper Paraguay river at Ladario is about 6 meters deep and 300 meters wide. 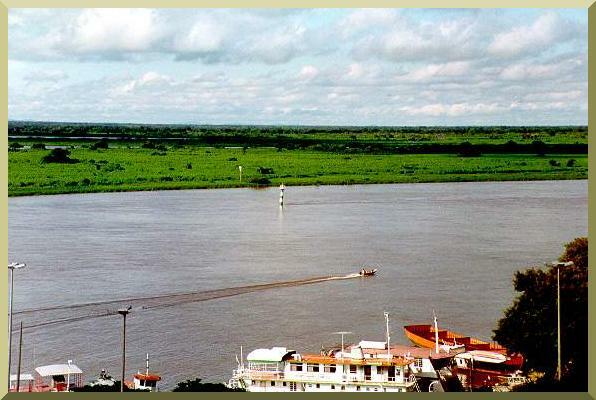 The Amazon river measured at the Obidos narrows is about 60 meters deep and 1600 meters wide. Yet, people who have not seen the data have a tendency to believe that rivers are much deeper than they actually are. During a field reconnaisance of the Upper Paraguay river near Ladario in January 1995, 1 I asked a local fisherman if he had been on the river for very long. He quickly responded: "All my life." I followed with a question: "How deep is the river at this point?" He looked at the river, and pronounced: "At least 100 meters deep." I learned then that local knowledge, no matter how close to the source, had its shortcomings. 1 Ponce, V. M.. 1995. Hydrologic and environmental impact of the Parana-Paraguay waterway on the Pantanal of Mato Grosso, Brazil, A Reference study. San Diego State University, San Diego, California, August, 124 p.
The Upper Paraguay river at Ladario, Mato Grosso do Sul, Brazil.